So twenty-four years ago today, Holly Gaiman turned up in my life. At that point she didn't even have a name: we had thought she was going to be a Gemma, but she didn't look like a Gemma, so Mary and I went back to the drawing board, or rather the baby names book, and decided independently that Holly was the name we both liked. Her middle name is Miranda because I wanted her to have a bigger, posher name in case she needed one. She hasn't needed it yet, but you never know. I miss her. She lives in London, now. I don't see her as much as I'd like, and I speak to her most days only because she's really good about phoning me. She's my daughter, and I love her. That goes without saying. She has the most amazing smile in the world, a will of iron, a huge heart, and is, I'm proud to say, one of my very best friends in the whole world. That stuff is all a marvellous bonus. I love you, Holly Miranda Gaiman. Happy Birthday. 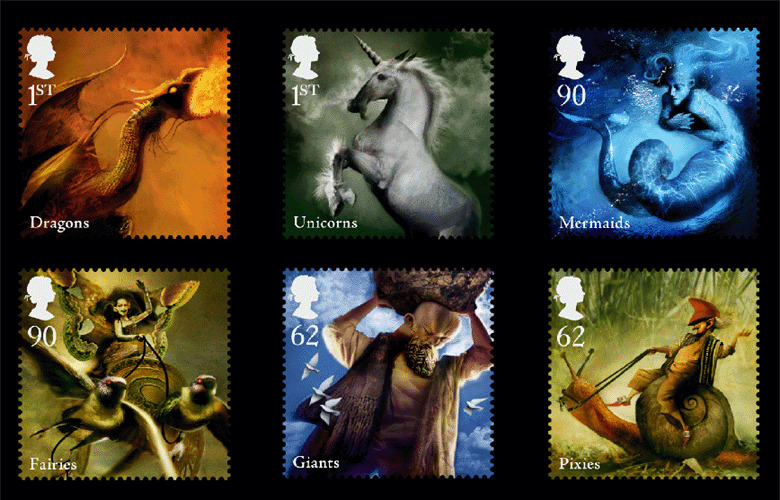 Just a quick one to let everyone know (particularly people in the UK) that, as the Telegraph just reminded me, the Dave McKean mythical creature stamps go on sale on Tuesday the 16th. So they are on sale now. They are printed in the "presentation packet", very beautifully. The native dragons of the British Isles, called wyrms, had poisonous breath and coiled snakelike around hills. They could not fly or breathe fire. They demanded oxen or maidens. They grew slowly, ate rarely and slept much. Local species can be fragile: the new dragons, the firedrakes, came south with the Norsemen, crossed the stormy seas with the Saxons, accompanied the Crusaders back from the hot lands in the centre of the world. Nature can be cruel, and soon the wyrms were gone, their bones turned to stone. The new ones spread, alien and invasive, until the time came for them to lay their eggs. Dragons nest on golden treasure, but British gold was hard to find, and soon they slipped away, another species that came and flourished and dwindled once again. 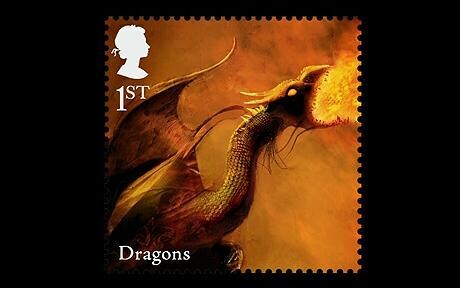 A handful of dragons hung on, half-starved in the Welsh wilderness, until time and the wet winters extinguished their fires. They went, like the wolf or the beaver; and they exit from the pages of history, pursued by a cave bear. ... a group of Christians in Wisconsin has launched a legal claim demanding the right to publicly burn a copy of a book for teenagers which they deem to be "explicitly vulgar, racial [sic], and anti-Christian". As I said on twitter, whatever side the "Christian Civil Liberties Union" is on, I'm now on the other one. Finally, for those who would like to learn about taking better photographs while at the same time seeing pictures of my awesome dog, here's Kyle Cassidy to tell you about depth of field. A quiet Sunday. My trainer, Todd, arrived this morning, took me for a walk and a bike ride. I thought I would let you know that, while your Contact Neil page refers anybody looking for information to your About Neil page and Biography, a lot of the information there is shockingly out of date. For instance, the Biography mentions nothing beyond 2004 - no Coraline movie, or Detective Comics, or Graveyard Book, and subsequently, no Newbery - and talks about 2005 events such as the release of Beowulf in the future tense. So... I was wondering... this wonderful Thow a Party win a Reading Thing-a-bobber... is it open to libraries? I have a group of teen volunteers who slave for me here at my library, who are very excited about the possibiltiy that the contest may indeed be open to libraries. Acting as the voice of reason, I said we needed to check the rules. I am not a very good voice of reason, because I am pretty excited about the possibility too. So, is it? We'll probably have a Graveyard book themed party anyway, but it would be a lot easier to sell it to the Higher Ups if we could possibly get an author visit out of it. No, I don't think the win-a-December-signing event is open to libraries. It's to encourage, and show support for Independent Bookshops. But I'm going to ALA in July to collect my Newbery, and there will be many librarians out there whose brains I can pick, and I bet we can come up with a library-friendly idea: there might possibly be some secret Library-related things in 2010 on the horizon, after all. Is your piece about the '87 Worldcon going to be available anywhere except the Anticipation programme booklet? '87 was also my first Worldcon. My own recollections, as a 22-year old student gopher include the moment when I somehow collected two entire TV news crews and was leading them round while completely failing to find anyone who knew where they were supposed to be, or why, or had any credible claim to be important enough to talk to them. Also the "we hate the hotel manager" Chinese wall, filk session, gopher party and (in hindsight blessedly) failed lynchmob. Right now the only place it's going to be published is the Anticipation book. But I do tell, in abbreviated form, the story of why my hatred for the Metropole Hotel and its manager is peculiarly undiminished, 22 years on. THEREFORE Mr. G should totally give the trophy to the Web Goblin should his blog win the British Fantasy Award for "Non-Fiction". Oh. Good idea. Sure, if the blog wins, the award is Dan's. Sorry to burden you with this; over the past year I've been reading as much R.A. Lafferty as I could lay my hands on, but it seems that not much (particularly in second hand books) have sifted through to Southern Africa. So I decided it was time to buy another short collection like "Lafferty in Orbit" or "Iron Tears", only they were all gone. Most pages for Wildside Press editions were gone or are simple "out of stock" and have been that way for weeks. And this is Amazon.com, not some local on-line retailer. Likewise, Wildside Press has no longer individual volumes of Lafferty's work on sale. I know you're not the executor of his estate, but I know you're one of the biggest Lafferty aficionados out there, second only to Michael Swanwick, and it was your generous mentioning of him on your journal that made interested in Lafferty. So I'm asking; has Lafferty's been dropped by Wildside Press due to the current world economic climate, or is this just temporary? If he's been dropped, then the world has grown a great deal colder, and not because it's winter here. I don't know whether or not the Lafferty books from Wildside Press are still in print (it doesn't look like it). But there's an awful lot of Lafferty out there right now -- look at the Lafferty entries on Bookfinder.com . And there are many hungry dealers in second-hand books who will be only too delighted to take your money in exchange for books. Trust me. So the last two weeks of madness is over and I am starting to look around and hoping one day to catch up. Chicago was fun, in a strange, sleepless sort of a way. I got in on an early in the morning plane, sleepily left my garment-bag behind on the plane (my assistant and Maure Luke made this better), had planned to spend several hours working in my hotel room on the speech. But the hotel room, when I got there, was already occupied, and the morning got stranger from there, which meant that my acceptance speech was rather more impromptu than I had hoped, but people liked it. It had been Decided that I wasn't doing a signing afterwards, something I thought was a bit disappointing when I learned about it. But I crashed shortly after, slept through both the Chip Kidd and Ivan Brunetti panel and the Chris Ware and Lynda Barry one that followed it, woke in time to have dinner with Jill Thompson and her husband, Brian Azzarello, at Katsu. Breakfast with Chip Kidd, who got to look at the first copy of Who Killed Amanda Palmer, and said nice things, and then to the airport and off to Toronto. I dined with Mark Askwith, who I have known for 22 years. We met in Gotham City -- literally, on the set of the first Tim Burton Batman movie -- and I would like to say that we have not changed, but we're both mellower and more contented and less spiky than we were then. We were both journalist-explainer-connectory people who loved comics and wanted to write them, and although he would write some comics he went one way, into television production, and I went the other. Next morning I went off to CBC to record The Hour. In the car on the way I was told that they'd decided the night before not to do an interview but instead to have me read off a list of 5 Crap Superheroes. I looked them over. They weren't funny. I asked the producer about it, when I got there, and wound up rewriting them, very fast, so they weren't quite as not-funny as they had been, but I'm not sure they ever made it all the way to funny. Then up from the deep basement to a radio studio where Sook-Yin Lee interviewed me for Definitely Not The Opera about fathers and sons, and it wound up being one of the most real and personal interviews I've ever done. The downside of being interviewed a lot is that people ask you the same questions a lot, and you wind up saying the same things over and over. Sook-Yin wanted to know things nobody had ever asked, and that I was happy to talk about. It goes out on the 20th of June. My favourite event was the next morning: I went to Nelson Mandela Park school. I read to the kids and answered their questions, then I was shown around the school and finally was taken to a room where thirteen small actors portrayed scenes from the first chapter of The Graveyard Book. It was delightful. In other news: Duncan Jones's film MOON opens tonight in LA and New York. I saw a preview back in February and loved it. Really good SF movie of the kind nobody makes any longer. I have been nagging Mitch Benn to set up an internetty sort of place to sell his songs directly for a year or so, and he now has it at http://www.corporationrecords.com/store/index/104. Please buy music from him, so he does not feel it has been a waste of time. Neil -- Congratulations on the "Coraline" musical. Thought you might be interested in this video of Schuyler Rummel-Hudson retelling the story of "Coraline." Schuyler has a brain malformation that inhibits her ability to speak, as recounted in her father Robert's excellent memoir, "Schuyler's Monster." Still, she's a remarkable storyteller in her own right.